We can not stress enough the importance of regular, annual, aggressive pruning. It is essential to maintain the ongoing vigor of the tree and to maximize the production of fruit. First year pruning sets the eventual shape of the tree. If your tree is taller than 4-6′ above ground, after it’s planted, trim it down to that height. Thin out the inward growing branches and any branches which are crossing over each other. Trim off the tips of the larger branches to encourage growth. See the illustration below for a before and after look at the branches. 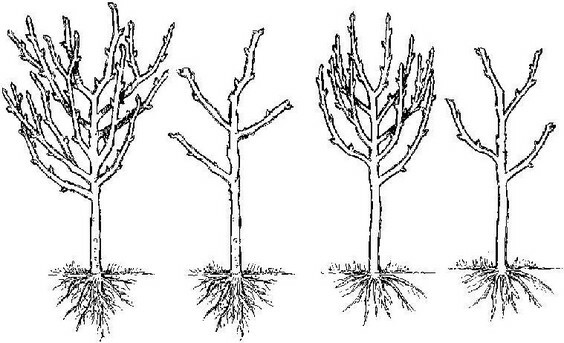 Any shoots or branches which come from BELOW the “bud union” should always be pruned – now and in the future. Brand new stems that grow out of the ground, from the root systems are called suckers. If you see them, simply cut them off at ground level. When the tree matures, suckering usually diminishes. If your trees set fruit this first year, pick off some of the immature fruits, spacing them about 8″ apart on the branches. This will encourage proper ripening, allow the spray to cover well, and improve vegetative vigor. Fruit thinning in the future is also important for the very same reasons. Less is more. If you don’t thin, you will get many more fruits than the tree can handle, resulting in broken branches and small fruits. So don’t be afraid to thin. The resulting fruits will be fuller and much nicer. In later years, it is helpful to “shape” your tree. Apple, pear and cherry trees are best trained to a central leader (uppermost upright limb). 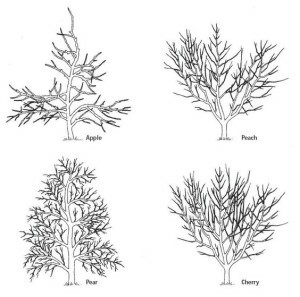 Peach, nectarine, plum and apricot trees should be trained to a vase shape (no central leader). 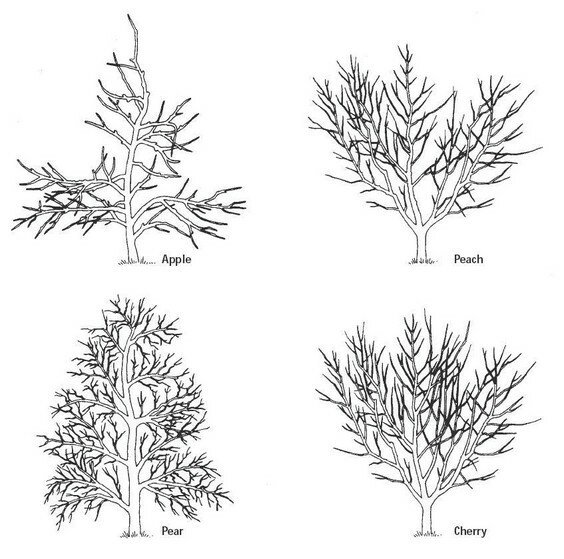 See the drawings below which show what your mature tree should look like. As you prune, bear this shape in mind and prune accordingly. Don’t be shy; it’s really hard to overprune a fruit tree. Apples and Pears – It is generally best to prune apples and pears when they are dormant. So pick a nice pleasant, sunny winter day and enjoy this part of orcharding. Summer pruning is helpful to retard growth of the tree. So if the tree is growing very aggressively and getting taller than you like, take it back in July to control this growth. Cherries – It is generally best to prune cherry trees when the weather is hot. Do not prune in the winter or late fall or early spring. Bacterial diseases are present in all non-arid environments and are particularly detrimental to sweet cherries. These bacteria are most active in cool, wet weather. So wait until the tree has leafed out and the warm late spring weather patterns are well established – usually by the end of May – to prune your cherry trees. Peaches, Nectarines and Apricots – The best time to prune peaches, nectarines and apricots is in the early spring. 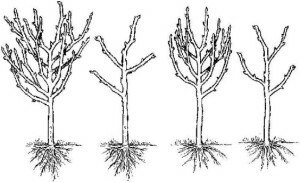 Try pruning after the last frost date for your area. At this time, most of the winter damage can be trimmed off and you will minimize the effect of late frost damage to your buds and blooms. Plums – As plums are very vigorous growers, you will want to prune aggressively. Bear in mind that summer pruning, when the trees is still growing, will help contain the spreading nature of your plum tree. You cannot over-prune a plum tree. So do clean up pruning in the winter, to get rid of broken and dead branches and shape up the tree. Then in July, prune again to maintain a manageable size. Tips on proper fruit tree spraying times are normally dependent on the types of sprays used. Here are the most common types for spraying fruit trees and the best time for spraying trees to prevent future issues. General-purpose spray – The easiest way to take care of all possible pests and problems with your fruit trees is by using a general-purpose spray mixture. You won’t need to identify every pest and disease that is bothering your tree, and it will cover those you might even miss. Check the label and use a mix that is labeled for fruit tree use only. Dormant sprays – To take care of scale insects, apply a substance called dormant oil. Dormant oils should be used early in the spring, before the leaf buds begin to open. They can cause damage to trees if you use them when the temperature drops below 40 degrees F. (4 C.), so check the weather for the next week before using these oils. Most fruit trees only need dormant oils applied about every five years, unless there is a large infestation problem in the area. Fungicide sprays – Use a fungicidal spray early in the season to eliminate scab disease, such as with peaches. You can wait a bit longer in the spring to use this spray, but do so before the leaves have opened. These general purpose fungicides should always be used when the daytime temperatures are steadily around 60 degrees F. (15 C.). Insecticidal sprays – Use insecticidal spray when the flower petals fall to take care of most fruit tree pests. The only exception to this rule for home use is probably the codling moth. To take care of this common insect, spray the trees again two weeks after the petals fall, and one final time in the middle of summer to take care of the second generation of moths that often arrives. No matter what type of spray you’re using on your fruit trees, take care to never use them just when the blooms are opening. This will avoid damaging the bees that are so important for pollination and fruit development. Fertilizers – Before you use any fertilizer please call Baeten’s. Let us walk you through the what, when and why of fertilization.